Juliet Marillier primarily writes adult fantasy, though she has also published two young adult fantasy series. 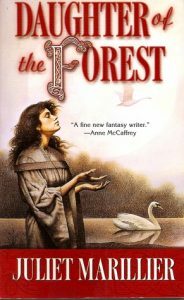 Her work often combines fantasy with historical fiction, folklore, romance, and mystery in her most recent series. A New Zealander by birth, Marillier now lives in Western Australia, where, when she isn’t writing, she likes to spend her free time fostering elderly dogs for her local animal rescue group. This is a woman after my own heart. I first discovered her books when I was living in a new house, in a new city, and I was too painfully shy to make new friends, so I read for comfort. That was the year I practically lived at my local library. I had ventured off into the adult books section (because YA books just weren’t as diverse and appealing, like they are now), and I found this pretty little book called Daughter of the Forest. Nice cover? Check. Cool author name? Check? Intriguing plot? Check. It was more than enough for my sixth grade self—I immediately checked it out, and so began my love affair with Juliet Marillier’s books. I ended up checking that book out so much that year, it became a running joke by my mother, “Oh, so you’re reading that again? That book is the first in Juliet Marillier’s Sevenwaters series, which originally began as a trilogy, but was so popular she was able to extend it with three books and a novella. Daughter of the Forest is based on a Celtic myth and set in Ancient Ireland—Sorcha is the daughter of a Lord, the seventh child with six older brothers who adore her. They spend their childhood running wild, until everything changes when their father is bewitched an evil enchantress, who puts a devastating curse on all of Sorcha’s brothers. They are turned into swans, and the only way for them to become men again is if Sorcha takes a vow of silence and completes a seemingly impossible task. The Dark Mirror is a book I was so excited about when it first came out; I saved up all my money to order it internationally from the publisher in Australia, so I wouldn’t have to wait for it to be published in the United States! It’s the first entry in the Bridei Chronicles, a trilogy that follows a young nobleman named Bridei who is training to become a druid and a girl named Tuala, who was abandoned by fairie folk. The fates of the two characters are forever intertwined, but outside forces work to keep them separate. This series is perfect for those interested in Druids, want to know more about the fairie folk, or for those who love their fantasy books full of magic. Dreamer’s Pool is her most recent series and everyone’s current favorite. It follows an embittered magical healer named Blackthorn and a former prison mate named Grim. They live on the outskirts of a mysterious forest, where Blackthorn is duty bound to help anyone who asks for it over a period of seven years. This first book in Blackthorn & Grim’s adventures involves helping a crown prince escape his impending marriage to a brutal young woman. This series has everything! Magic! Adventure! Mystery! Comradery! Wildwood Dancing and Shadowfell are two young adult fantasy series—the first being a retelling of the classic fairytale the twelve dancing princesses, this time being set in Transylvania. The second is about a powerful and magical young woman named Neryn, who can communicate with the fairy-like Good Folk. She sets out one day to find Shadowfell, a home and training ground whose purpose it is to overthrow their despotic king. Finally, Marillier’s only stand-alone book, Heart’s Blood (which can also be found via ILL), is a retelling of Beauty and the Beast, and if that’s not enough to pique your interest already, I’m not sure what will be! If you want to be swept up with top-notch world building, fantastical plots with powerful heroines, heart wrenching love stories, and hauntingly beautiful prose, Juliet Marillier is the author for you! —Kimberly Lopez is a Readers Services Assistant at Lawrence Public Library.